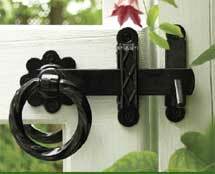 Popular Thumb & Twisted Ring Gate Latches in Hot Dipped Galvanized or a Black Polyester Powder coat over galvanized finish & Stainless Steel for excellent rust and corrosion protection. See Finish for more details. 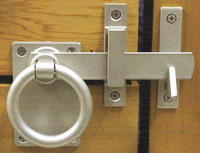 Optional Padlock Eyes provide security where it is required. Use a Gate Stop in all Latch installations to protect your latch from damage in windy conditions or when a gate closer is used. Our warranty requires the use of a gate stop. Most Latches are operable from both sides. All products come with screws, carriage bolts and other hardware required for mounting unless noted otherwise. See the selection of Latches for Field and Farm Gates in the Field Gate Latches section. WSEP Items include Padlock Eyes - Every Latch needs a Gate Stop. LESP Items include Padlock Eyes. 316 Marine Grade stainless steel and including a gate stop. 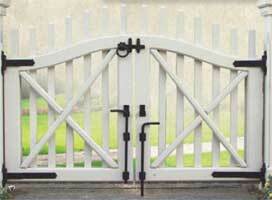 Made of 316 Marine grade stainless steel and includes a gate stop. 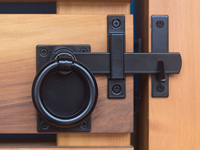 Popular Thumb & Twisted Ring Gate Latches in Hot Dipped Galvanized or a Black Polyester Powder coat over galvanized finish for excellent rust and corrosion protection. See Finish for more details. Made of 316 Marine grade stainless steel and including a gate stop. Use with Ring Gate Latches (4149 & 6149) if gate thickness is over 5".